Disney Inside Out Ornaments Will be Hanging from Christmas Trees This Year! The Christmas holiday is one that many people treasure. There are traditions like baking certain kinds of cookies, going caroling with friends, having holiday parties, and of course, decorating the Christmas tree. I know people who love to decorate trees so much that they have two or three around their home, each of them with a different theme. That way one tree is not overloaded and there Christmas spirit can be seen in different room in the home. There are other families who permit their children to have their own miniature trees inside their bedrooms. These are filled with special ornaments that mean something to that child. It keeps the joy of the season right in front of their children's eyes. When taking out the Christmas tree ornaments each year, it is like a trip down memory lane. How would a nice Jewish girl from New York like myself know about this? Because my husband is not Jewish, and we agreed to raise the children in my faith as long as he could put up a tree each year. When we take out the boxes of ornaments we have collected since we were married in 1987, I get nostalgic. Of course, there are the ones that we bought during our first holiday season together. Then there are the ones we were given as gifts from his family. We even have some that my husband made in Sunday School back in the early 1970’s. What a trip to see those macaroni bells spray painted with gold! My favorite ornaments are the ones from his grandmother and his parents, who are all now deceased. These delicate balls of glass are worth a lot of money, but never in a million years would we sell them. They hold many dear memories for my husband, as well as for myself. Our older daughter has a large collection of ornaments since her father’s family used to give them to her and we used to buy them. Looking at her old Disney and Barbie ornaments remind us of the time when she was a little girl and these were her favorite characters in the whole, wide world. Buying special ornaments that remind you of what you love at this time of your life will bring a smile to your face years down the road when whatever you enjoyed is no longer popular. This summer, Disney/Pixar's Inside Out has taken the nation by storm. It will come as no surprise that Disney Inside Out Christmas ornaments will be showing up on trees and holiday decor this upcoming holiday season. The plot of the film surrounds the life of 11 year old Riley as she transitions to a new home in a different part of the country than where she was raised. Movie goers get to go inside her head (and the heads of her parents as well) in a most hilarious film experience. The vocal cast are some of the funniest comedic talents in Hollywood-Lewis Black as Anger, Mindy Kaling as Disgust, Amy Poehler as Joy, Phyllis Smith as Sadness and Bill Hader as Fear. Combine their voices with classic Disney/Pixar animation, and you have a bona fide summer smash hit on tap for families to see over and over again. With so many funny and colorful characters, it might be difficult for a child to choose just one to put on their tree. No worries! 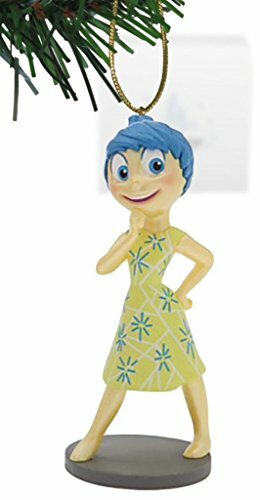 There is a 10 piece Inside Out ornament set that features the five emotions, as well as five other characters that are featured in the movie. If you want a smaller grouping, the five emotions are available of as a set on their own. Disney Inside Out Christmas ornaments are also available in different duos and trios of characters. If a particular emotion strikes your fancy, that one is available as an individual ornament. Sadness is so "woe is me" and disgust reminds me of my tween aged children. These two are seriously funny! Both ornaments can also be purchased on their own. These characters are going to brighten up any kind of tree, whether it is a miniature tree for a child oran office desk or a large one with a Disney theme. This set of ornaments feature the five main emotions that rule Riley's life. Create a Tree Filled With Joy! Her captivating personality is one that all of the other emotions love. She is the dominant emotion for most of Riley's life.